US-based Nonin Medical has announced the addition of a memory volume indicator (MVI) mode to its WristOx2 Model 3150 wrist-worn pulse oximeter. The new MVI mode for Model 3150 WristOx2 oximeter provides a graphic display of the amount of recorded data in hours and minutes, helping insure that sufficient data has been recorded during oxygen verification testing. The WristOx2 Model 3150 pulse oximeter, which is worn on a patient’s wrist, enables physicians to monitor the pulse rate and SpO2 levels of a patient over a prolonged period, such as during sleep studies. Nonin Medical product marketing manager Brian Balleria noted the addition of the MVI mode in the Model 3150 WristOx2 is in direct response to customers who have asked the company to help them verify their testing data. "By providing the MVI mode, clinicians can now provide Independent Diagnostic Testing Facilities and Home Care companies’ proof that sufficient data has been recorded during oxygen verification testing; preventing unnecessary trips for repeat recordings, reducing costs, and improving overall efficiencies," Balleria added. Nonin will demonstrate the MVI mode in the Model 3150 WristOx2 at the Medtrade Spring Conference in Las Vegas, 11 March to 13 March 2014. 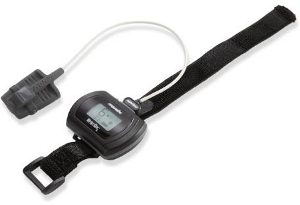 Image: Nonin Medical’s WristOx2 Model 3150 wrist-worn pulse oximeter. Photo: Courtesy of PRnewswire/Nonin Medical, Inc.